For the next few weeks or so, do not be surprised to witness groups of RI students, girls and boys alike, roaming the campus with starkly shaven heads. On 18th July, RI hosted their Hair for Hope satellite event 2014 in the ISH with over 200 courageous student volunteers shaving to support children with cancer. This year, Community Advocate has put substantial effort into bringing out the event theme of “Go Without, Look Within”, a slogan that connected deeply with many of the shavees by reinforcing the purpose of the ceremonial shaving, namely to find an intrinsic purpose in shaving strong enough that you would relinquish material effects in order to stand up for this common cause. 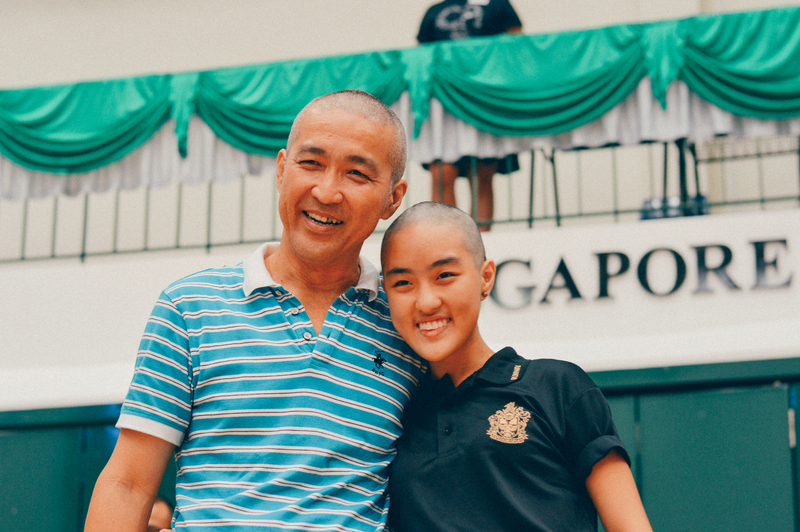 Even as our shavees did the deed with their individual motivations, the event held an unusually personal significance to the school; that of supporting Mr Chan Poh Meng’s current battle with cancer, as mentioned by Mr Mag in his speech during the opening ceremony. From the beginning of the event, the deep sentiment behind the event was further emphasized as the ceremonial shavees each shared their personal motivations for shaving. For Daniel Sitoh, Chairperson of the Raffles Community Advocates, it was for a deeply personal reason– as a tribute to his grandfather, whom he was close to, passed away from cancer last year. For Shermaine Ng, shaving was about courage. Like many others, she’d skirted the matter and eventually backed out for the past two years. “It might just be hair, but you will hesitate anyway”, she shared in her speech. And indeed, for girls especially, walking around with a bald head inevitably draws stares from passing strangers, as Shermaine bears testament to in her blog. In fact, managing to stand strong against this often disconcerting attention fulfills the intention of challenging the social stigma childhood cancer patients face. As the event carried on, students began to stream into the hall, and we got comments from several members of the crowd. Unsurprisingly, shavees cited a wide range of reasons for their participation– from personal reasons to raising funds and awareness. It is interesting to note that while some shavees believed awareness was the main purpose of the event, others were doubtful of the capability of the event in raising awareness but instead shaved for the funding it would provide for cancer children. One such person was Naresh Manoj (15A01B), who shared that he did not personally believe in advocacy, instead doing it for the purpose of raising funds, although he fully supported CA in their aim of raising awareness. Even within CA itself there seemed to be disagreement — on the one hand, head of organising team Tan Hui Ying (15S03I) remarked that “It [shaving] is about being ambassadors and the publicity”, and that “behind the hype there are real stories to tell”. On the other hand, the CA teacher I/C, Ms Ruth Ong held that “shaving is good for your own soul, but is ultimately limited in helping the cancer patients”, instead granting greater importance to the concrete support given by fundraising. At first glimpse, an event where the organisers cannot single out their main goal seems to be cause for alarm. Yet does it really matter that the personal motivations of the various stakeholders may differ? As we spoke to several of the event organisers, we uncovered an especially compelling sense of their conviction in their event slogan, “Go Without, Look Within”. At the end of the day, the message to take away is that we shouldn’t shave for the sake of shaving. Ms Ong shared with us her personal thoughts on how shavees should really be making an effort to collect money instead of shaving with a (mostly) blank card, and how some of these people may be “too occupied with looking good rather than being good”. Shaving is after all something that draws attention to the self, with eyes lingering on the egg-shaped heads longer than one would expect, to the extent that it sometimes becomes a “cool” thing to do. Something that perturbed us was how many shavees were instantly surrounded by friends clamouring to touch their newly bald heads and take numerous selfies. This seemed to place the spotlight on the perceived courage of the shavees rather than the gravity of the issue, and begged the question of whether it was more a publicity stunt than anything else. Thankfully, only 27 out of 237 shavees this year came in with the minimum $20 donation required to participate, an optimistic indication that most students registered with the best of intentions. The theme of “Go Without, Look Within” is one that applies to more than this event alone– looking within each of us and doing what is good for yourself and others. Shaving, as with any other good act, should never be for the sake of looking good. 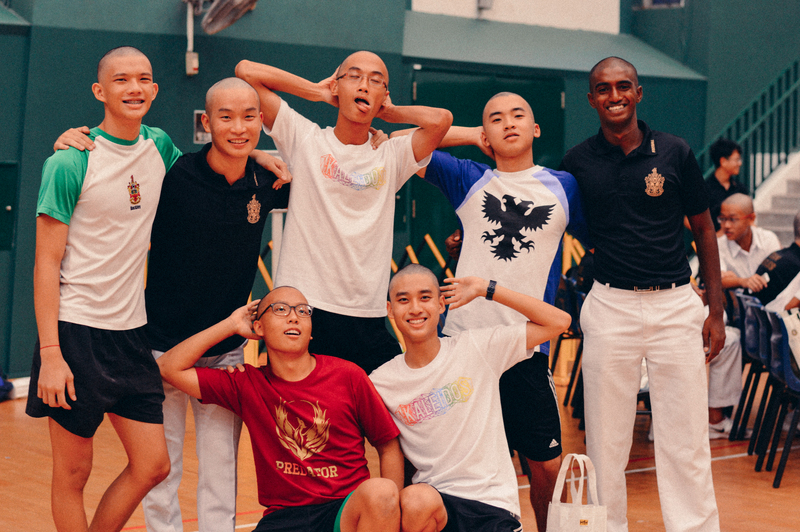 To borrow Ms Ong’s words, the focus of any altruistic action should not be looking good, but being good — reflected by the organising team’s attempt to shift the focus away from the image of baldness, and more towards inculcating the spirit of advocacy in the shavees. Beyond all the hype that comes with such an event, we must not forget the reason for shaving. Whether your personal motivation for shaving is advocacy, raising funds, or most heart-rendingly, personal experience, it ultimately serves one purpose: to show the children that they are not alone. Hair for Hope 2014 at RI has raised over $40,000 to date. If you would like to contribute to helping the childhood cancer patients, you can donate to HFH here. Donations close in September 2014.